When we look at trees, we are awestruck by their beauty. We marvel at their shape, their sculptural features, their solidity and strength, and their twisted branches reaching for the sky. We feel not just a love of their natural beauty, but also a deep respect for the years they have endured on our planet. It is only natural for us to feel a deep connection to trees. And it is just as natural to want to adorn and celebrate them during the holiday season. 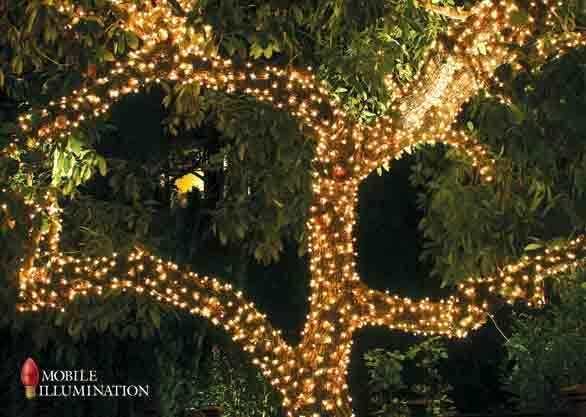 Many people aren’t familiar with the myriad of ways tree wrapping and tree lighting can be done with Christmas lights. Different trees lend themselves to different designs, different light styles and different wrapping techniques. Following are a few beautiful examples for residences and commercial properties. Where just the trunk of the tree is wrapped in lights, usually just up until the branches start. This is the most basic and straight-forward way of wrapping or lighting a tree. Just the opposite of the trunk wrap. This is when the branches of the tree are wrapped but not the trunk. This can be very dynamic and looks amazing when done on trees with several branches. A combination of the Trunk Wrap and Branch wrap. It includes both the trunk of the tree and the main branches. Where the trunk main branches and even the offshoots of the main branches will be wrapped in lights. A tree wrapping design that uses wide spaced C7 lights to make the design “pop”. Do you have palm trees on your property? 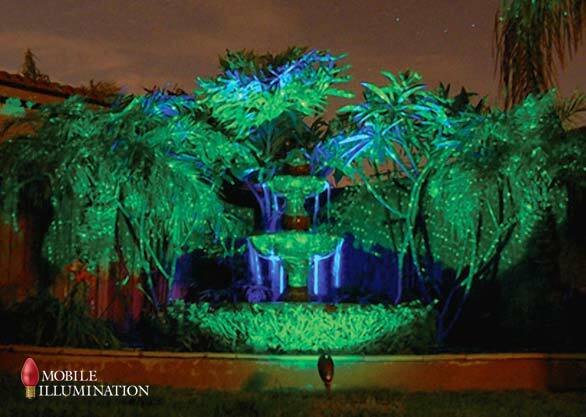 Mobile Illumination can wrap both the trunk and the fronds in lights for you, either in the same color or in two different tones. 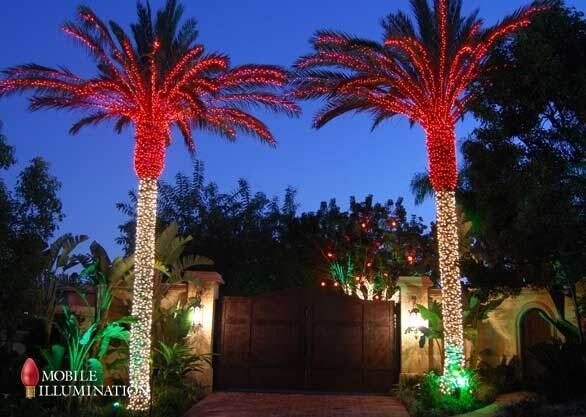 No tree is too tall, we have lit palms over a hundred feet in height! 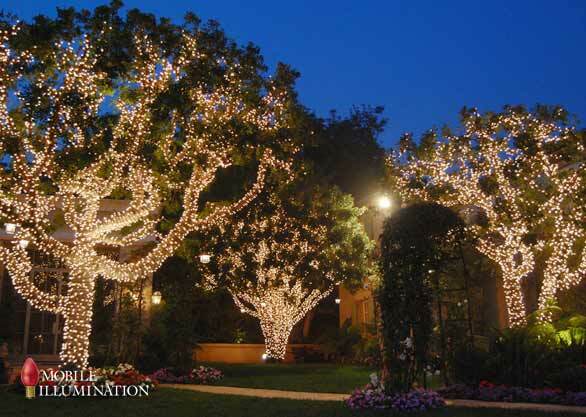 Traditional and LED Christmas lighting styles aren’t the only way to light trees. You can add even more flair by lighting a tree with lighted Spheres. Decorative spheres hang at varying heights and distances from each other and add a whole new dimension to the tree. You can also combine a partial or full wrap with spheres for an extra special look. Yet another alternative for decorating trees is Snowfall Tubes. Snowfall tubes add another dimension, with warm light LEDs that trickle down the tube to mimic falling snow. This effect is really fun and fanciful, and makes for a very unique design. 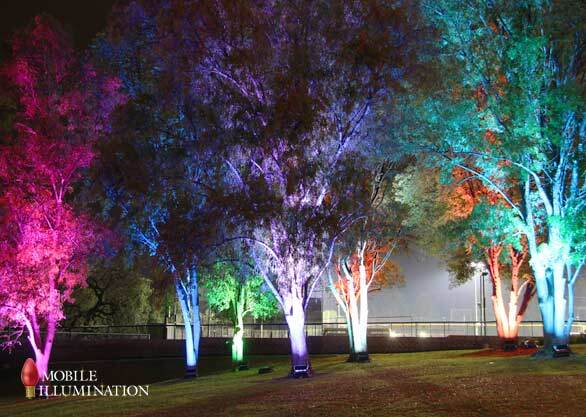 Another unique lighting technique is the LED Wall Wash. A color-changing LED light shines onto your trees and “washes” them in color, creating a truly dazzling effect. An extension of LED wall wash is called Bliss Lighting. Bliss lighting uses non-harmful, refracted laser beams to add a sort of sparkle or star pattern within the light wash of the LED for a more modern look. 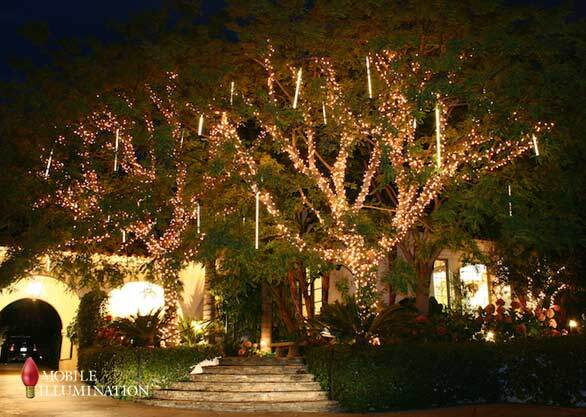 Tree wrapping and tree lighting is one of the most fun and exciting elements of your overall Christmas lighting design. 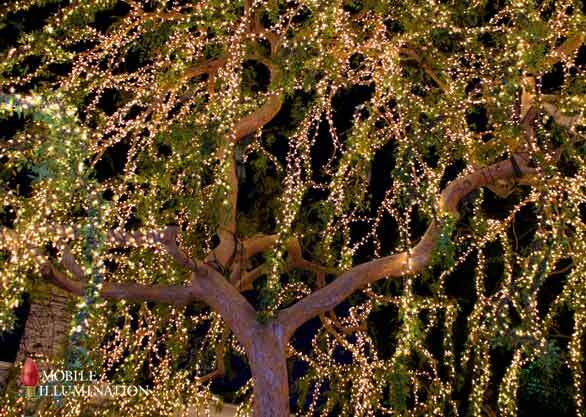 Many people like to hold Tree Lighting Parties, where the lighting design of a tree is dramatically revealed for the first time. 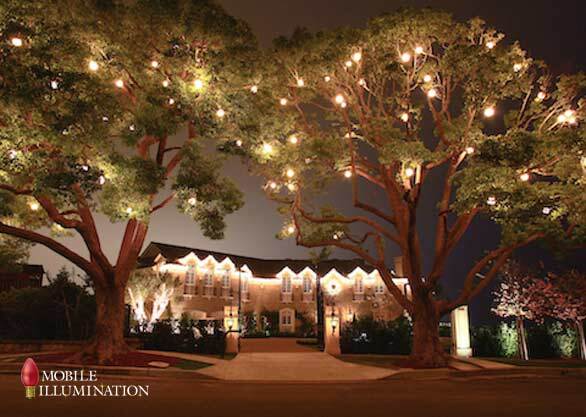 At Mobile Illumination, we know that there is definitely more than one way to light a tree. 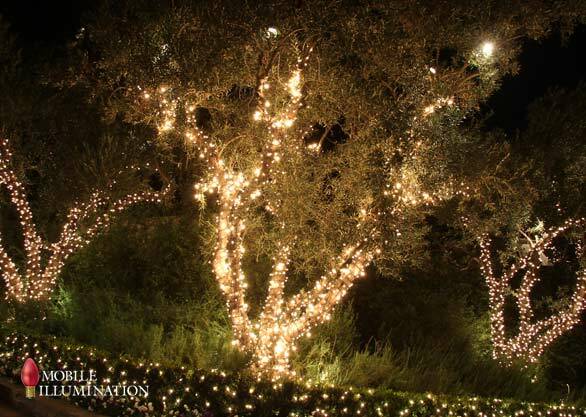 Give us a call today, and let us help you create a beautiful Christmas lighting design for your beloved trees.